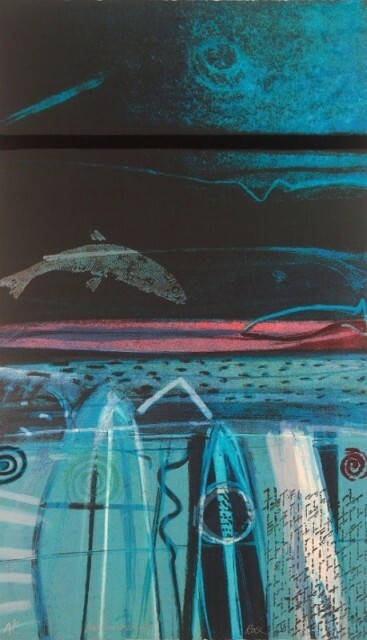 Barbara Rae CBE RA has taken inspiration from the atmospheric and mysterious colours of Scotland and Ireland in her latest silkscreen prints. Rae’s paintings combine the influence of landscape and travel with painterly abstraction. When Barbara Rae was awarded a travel scholarship in 1966, it unleashed a love of travel that remains with her. Although she does not like the term landscape painter, the importance of place is very apparent in her works; in particular the human traces and patterns of history that are left on a landscape. Spain is Rae’s favourite destination, providing her with endless inspiration as we can see in her latest work. Rae’s printmaking has been integral to her artistic activity since her student days. The way Barbara Rae conceives and works on her monoprints, screenprints and etchings complements and informs her approach to painting. The discipline imposed by these media and the unique opportunities offered by them create a set of possibilities, which stimulate her vision of the world, whether she is drawing, painting, making prints, or simply observing. Solo and group exhibitions nationally and internationally have been a regular feature of Barbara Rae’s upward trajectory. Her work features in many private collections in Britain, Europe and the USA, as well as in many public and corporate collections. Recognised nationally and internationally, Barbara Rae was elected president of the Society of Scottish Artists in 1983; made a Member of the Royal Scottish Academy in 1992; became a Royal Academician in 1996; a Member of the Royal Fine Art Commission for Scotland in 1995 and a Member of the Board of the British School at Rome in 1998. Barbara Rae was awarded a CBE and received an Honorary Doctorate from Napier University, Edinburgh in 1999. She lives and works in Edinburgh.